Talinda Bennington wrote that "we had a fairytale life and now it has turned into some sick Shakespearean tragedy. ... How do I pick up my shattered soul?" 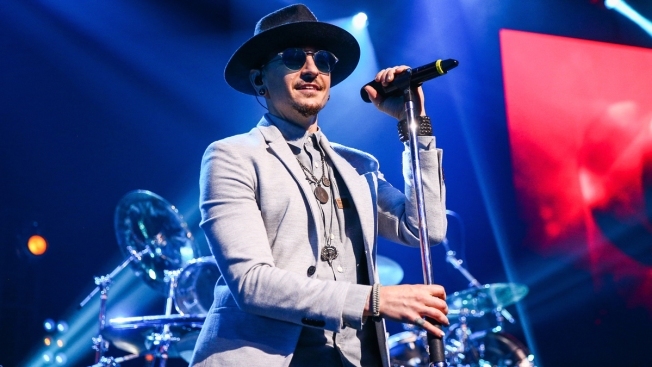 In this May 22, 2017, file photo, Chester Bennington of Linkin Park performs on stage at the iHeartRadio Album Release Party in Burbank, California. Bennington died by hanging last week. The wife of late Linkin Park singer Chester Bennington says she's feeling the love from the rocker's fans but she's also feeling the loss. Bennington was found dead on what would have been the 53rd birthday of Soundgarden frontman Chris Cornell, who hanged himself in May. The two were friends.